Celtics center Kelly Olynyk, who had been out since Jan. 22 before returning to action on Wednesday, played a little keepaway from Utah’s Rodney Hood. After a couple of close calls, the Celtics became whole Wednesday with the return of forward/center Kelly Olynyk after an 18-game absence because of a sprained right ankle. Olynyk was hurt when he landed on the foot of then-Portland forward Thomas Robinson in the fourth quarter of the Celtics’ last-second victory Jan. 22. After being projected to return soon after the All-Star break, Olynyk didn’t show signs of being ready to return until the past few days. Olynyk, who checked into the game at the 1:35 mark of the first quarter, played eight minutes in his first stint, missing his first three shots and committing two fouls. He didn’t play in the second half and finished with zero points and one rebound in 7 minutes. The Celtics have changed considerably since Olynyk’s injury, adding Isaiah Thomas, Jerebko, and Gigi Datome through trade. The Celtics hardly looked at the 24-35 Jazz as a layup following two difficult games against the Warriors and Cavaliers. Part of the reason is because the Jazz have been among the best defensive teams in the league and have allowed an NBA-low 82.7 points per game since the All-Star break. Second-year center Rudy Gobert has been a terror, amassing 80 blocked shots since Jan. 1, 11 more than the second-highest total from Philadelphia’s Nerlens Noel. “They’re playing great,” Stevens said. “One of the more impressive teams I’ve seen since the All-Star break. And their defense has been outstanding and it’s to be expected somewhat when Gobert’s minutes go up because he’s an absolute force on that end of the floor and he’s becoming really good on the other end of the floor. I’ve always thought they had as good young talent as there is around and they’re doing a good job. As Jared Sullinger arrived at TD Garden still wearing a boot on his left foot because of a stress fracture, his best friend and AAU teammate Trey Burke was in town with the Jazz. It’s the second season-ending injury for Sullinger, who has been criticized for his conditioning and agrees he needs to get in better shape. Burke said he has full confidence that Sullinger will return in better form. Burke said there have been constant doubts about Sullinger being bulky and undersized since he was in AAU ball. Guard Marcus Smart was named Eastern Conference Rookie of the Month for February. Smart averaged 9.8 points, 4.3 assists, and 1.64 steals in 11 games, all ranked third amongst rookies. Andrew Wiggins of the Timberwolves won the honor for the Western Conference . . . Avery Bradley briefly left during the first quarter after complaining of arm pain but returned with what was diagnosed as a left elbow contusion . 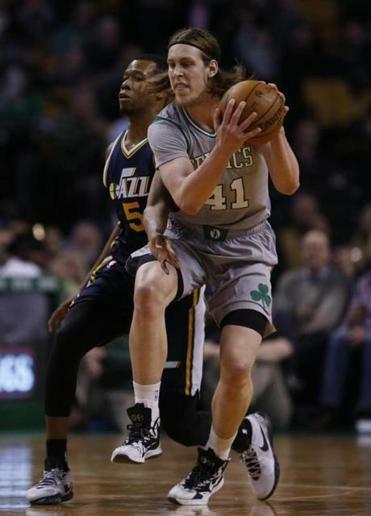 . . With Olynyk in the lineup, Shavlik Randolph was placed on the inactive list along with Sullinger. Randolph has played in three games since rejoining the Celtics, including in Tuesday’s loss to the Cavaliers. Gary Washburn can be reached at gwashburn@globe.com. Follow him on Twitter at @GwashburnGlobe.